Most fashion documentaries are of limited appeal to a general paying audience. But there have been a number of fascinating fashion documentaries, among them The September Issue, which was an insightful look at Anna Wintour, the powerful, cold and enigmatic editor of Vogue, and the delightful Bill Cunningham New York, about the genial and elderly photographer who rode around New York on his bicycle taking candid shots and attending some of the most glittering opening nights. But unfortunately, Advanced Style is aimed at a specific demographic and general audiences may find it neither particularly engaging nor interesting. 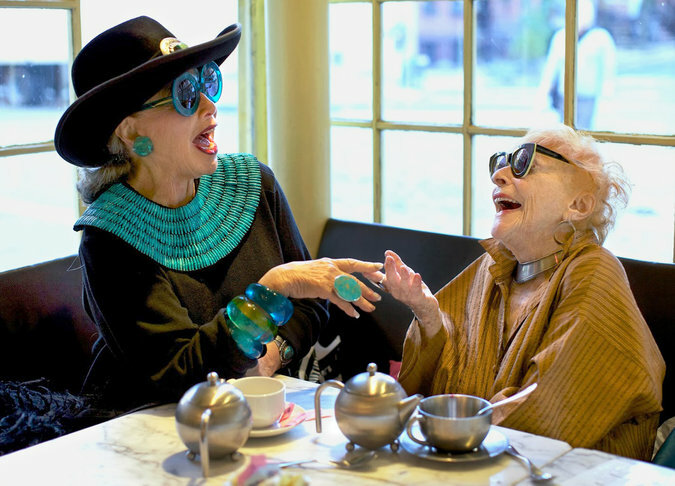 The documentary follows flamboyant New York photographer Ari Seth Cohen, who captures portraits of stylish, colourfully dressed elderly women on the streets of New York for his blog site and coffee table book. Cohen apparently started the blog as a way of documenting his grandmother’s unique fashion sense, and it grew in popularity. Although Cohen is credited as co-writer, the film is not so much about him and his blog as it is about a number of interesting women he has photographed. Advanced Style looks at a handful of women and their colourful fashion sense, their unconventional life styles and habits and forthright views on aging and beauty. Among the women we meet are the sprightly 79-year-old Lynn, who runs the fashion boutique she has owned for decades; legally blind 81-year-old Jacqui who was one of the original dancers at the Apollo Theatre in Harlem and who is still a regular fixture of the venue during tours; and 93-year-old Ilona who found fame for her portrait of author Ayn Rand. Undoubtedly it is interesting and somewhat inspiring to see these women, all aged between 65 and 95, so positive and full of energy and life, and who are challenging the conventional ideas about fashion, beauty and aging. These ladies create their colourful fashions through buying clothes at thrift shops and accessorize their creations and they use the streets of New York as their impromptu catwalk. Along the way they deliver pearls of wisdom such as: “money has nothing to do with style.” They also seem to lack inhibitions about their often eccentric and outlandish mode of dress. And at one stage they even appear on the Ricki Lake Show displaying their fashion sense to a delighted audience. However the film doesn’t delve deep enough into the lives of these women, which may have made for a more interesting film than this rather superficial documentary. There is a poignant note to the film too as 95-year old fashion icon Zelda Kaplan passed away during the filming. Advanced Style is the first feature film from director Lina Plioplyte, and is undoubtedly a labour of love. But even though the film has a relatively brief running time of just 72 minutes, there seems to be a lot of padding here that stretches it out interminably. And it has the visual style and depth of the kind of hour long documentary you would probably find on the fashion channel on television. Plioplyte has shot a lot of the material on the streets of New York itself and you get a sense of this vibrant city and its culture. But overall Advanced Style seems to be little more than an extended puff piece promoting Cohen’s blog and book. And audiences usually want something more substantial from a documentary. Or maybe I’m just not the target audience for a film about elderly ladies and fashion!